St James's Church hall, the Fitz Wygram Hall, was specially designed and is adjacent to the church. It is suitable for parties, meetings, evening classes, etc. The united entrance to both the church and the hall has a 'lych gate' appearance, facing St James's Road. The resulting link forms an enclosure or cloister between the two buildings. This pleasant paved courtyard can be used for open-air activities. Bench seats and cycle blocks have been installed in the courtyard. There is a covered way, with windows on either side, connecting the south porch of the church to the main entrance of the hall with disabled access. The overall effect is both modern and appealing, "a building for today and for years to come". The spacious downstairs has a beautiful wooden strip floor and long windows at each corner. Each window gives a different view, the churchyard, the road and the courtyard with the overall aspect being one of light and space. 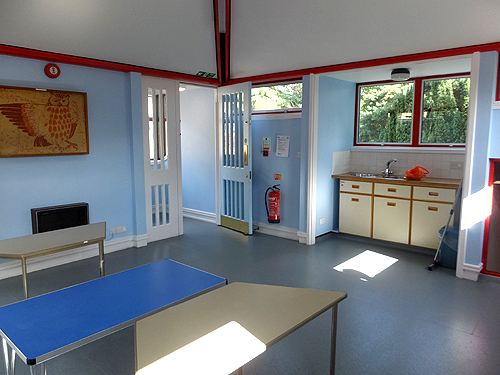 This large function room, about 7.5 x 13.75 metres, has tables and chairs for both children and adults. 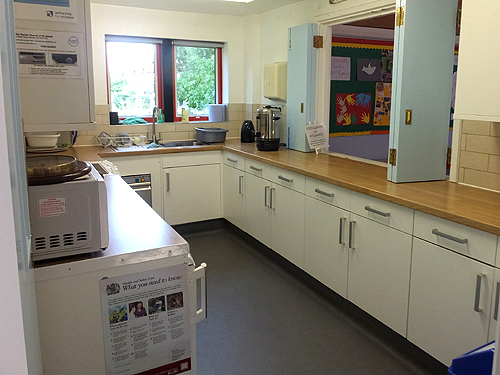 The main hall has an adjoining well-equipped kitchen. There is an electric cooker, fridge, microwave and dishwasher, plus plenty of crockery and cutlery. There are also wine glasses to welcome friends at big occasions as well as electric kettles to help supply cups of coffee and tea. There are separate toilets for men and women, including one for disabled people and with baby-changing facilities. Upstairs there is a smaller, carpeted room, again with long windows and a roof-light. This upper room is about five metres square, with its own small kitchenette, and there are tables and chairs for both children and adults. This room is used for meetings and activities for small groups of people. The Sunday School has had several sleepovers here, even surviving the chiming of the church clock! 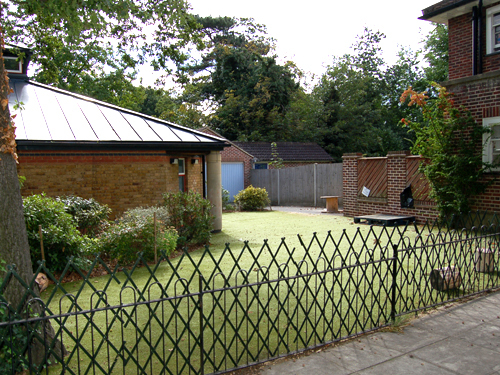 On the other side of the hall there is a side garden with shrubs and small artificial lawn, which can also be used for outside activities and refreshments. Just in front of the hall there is a small car park for six cars and there is plenty of street parking along St James's Road and also in other nearby roads. The Properties Team supervises the hall's maintenance and the Administrator organises the bookings and both ensure that it continues to be a valuable resource for the parish. The hall has a strong community feel, and since opening has served hundreds of local families, many of whom are members of the congregation. It is used for Parish Breakfast on Sundays and also throughout the week for numerous meetings and social functions. St James's Sunday School, Hampton Hill Nursery School and various groups and classes use the hall regularly, with some regular hirers booking certain days each week. The hall is also used for dances, quizzes, meetings, a wide variety of children’s parties, with entertainers, as well as dinner parties, family celebrations of baptisms, anniversaries, birthdays and weddings. Not least the hall is often used as a Polling Station for local and general elections! Anyone interested in using the hall should go to the page Bookings.